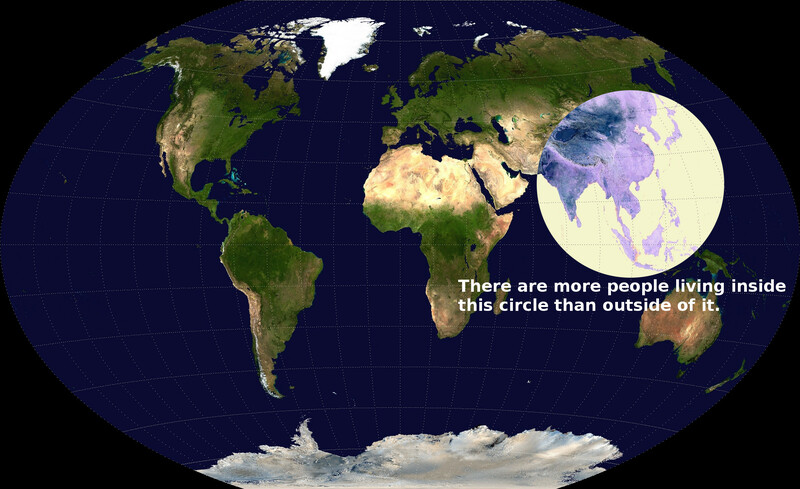 East Asia is the most densely populated region on the planet. With that comes growing economic clout but also significant development challenges. Successful achievement of sustainability goals in East Asia will impact more lives than action in the rest of the world combined. Because of this the actions of this region are important not only as examples for the rest of the world but also as the largest scale sustainable development actions in the world. This series will focus on all of the sustainability challenges and opportunities in this area of the world that is rapidly becoming the most important locus of sustainable development. The Little Ice Age was global, but its effects varied by region. Many factors – political, socio-cultural, and environmental – determined this variance. Particularly, location relative to the ‘temperate zone’ (roughly 30 to 50 degrees of latitude) influenced the damage climate change caused in agriculture. China is a good example of the importance of micro-climates. In temperate regions like Zhejiang of eastern China, the growing season is longer than in other regions, but cold spells and droughts afflict disproportionate damage during germination periods and the early growing season. By contrast, in cold-temperate regions such as Manchuria, the growing season is shorter, and the risk of climate-induced crop failure is far greater. Thus, examining the Little Ice Age requires both a macro-perspective that charts the global crisis, and a micro-perspective that acknowledges the heterogeneity of impact. In East Asia, we can identify traces of the Little Ice Age in different places at different times, but more research is imperative to track local variants over time. Yet, even with current data, scholars are growing convinced that Tokugawa Japan (1603-1868) was a unique case in East Asia, and in the world for that matter: it supposedly endured the ‘global cooling’ relatively unscathed. How did Japan manage? Notwithstanding these feuds, Japan achieved steady increase in agricultural output and population growth during much of century, certainly after the 1640s. Japan had “simultaneous increases in total land cultivated, harvest yields and urban population.” New villages (over 7,000) sprawled into its hinterlands, urban population increased by six-fold, and the average rice production per village rose by at least 15%. One explanation we can rule out is that Japan’s climate was simply more benign. As Parker argues, the temperature drop was no less palpable in Japan than in other places. During the winter months of 1641-2, merchant Enomoto Yazaemon wrote in disbelief that Edo (modern day Tokyo) had its first snow six weeks earlier than usual. “On New Year’s Day,” he added, “pots and pans full of water froze and seemed likely to burst; and one foot of frost covered the fields.” Snowfall is rare in normal conditions around Tokyo past and present. Even today, heavy snowfall can paralyze the city, and cause deaths, as in February of this year. Japan’s northern areas probably had it worse, given their climate-related vulnerabilities that were likely exacerbated during the Little Ice Age. For example, on northeastern Honshu, the Chishima Current brought arctic water from the Bering Sea, which shortened the growing season, and lowered ambient temperature and agricultural productivity. Further, farmers in the area feared the so-called ‘Yamase effect,’ or summer cold caused by wind blowing from the sea of Okhotsk. Finally, Japan seems to have suffered from over-cropping generally during the Little Ice Age. Historian Conrad Totman argues that “aggressive cultivation of recently deforested land and the prevalence of ‘clear cutting’ on steeply sloping ground crowded the biological boundaries of crop viability.” In other words, due to over-exhaustion of resources and tillable land, Japanese agriculture stood on shaky soil, literally and metaphorically. Its total food output was rising, but at the same time it was becoming increasingly vulnerable to climate shocks. If this is true, how did Japan manage better than others? First, we may begin by examining Parker’s argument that Tokugawa Japan managed thanks to the Industrious Revolution and to the efficacy of its tyranny. The former refers to the idea that Tokugawa Japan, unlike Western Europe, followed a labor-intensive, capital-saving developmental path, also known as the Industrious Revolution, which increased total agricultural output with greater labor input and in the absence of major technological breakthroughs. In other words, peasants practiced “self-exploitation” to meet subsistence needs. Output was increasing but both in humanitarian and environmental terms, it was unsustainable. This, together with “prudential strategies” by Japanese families such as abortion and infanticide, is a cogent argument for Japan’s “success,” at least for the seventeenth century. Parker’s second explanation is weaker, and what other historians may call Eurocentric. First, he uncritically embraces the characterization of Japanese government as “the greatest and powerfullest[sic] tyranny that ever was heard of in the world” by an unhappy British privateer who fell out of favor with the Tokugawa authorities. Parker then advances this view by outlining how the Japanese state eliminated political dissidents, proscribed foreign contact, and suppressed popular rebellions. Supposedly, Japanese ability for social and political control “neutralized some of the worst effects of the Little Ice Age and created conditions favourable to rapid economic and demographic growth.” But was Tokugawa Japan a tyranny in the first place? Perhaps so from a Western perspective, particularly if we’re drawing from the age-old trope of Oriental despotism. Yet, Japanese history should be read in terms of the past, and of the Japanese people themselves. Instead of simply calling Japan an effective “tyranny,” I would instead specify this efficacy as the prowess of its social institutions, which worked in tandem with the state to make ad hoc adjustments in times of crisis. If we examine Japan’s response to climate-induced famines during the 1600s and the 1700s, we can glimpse the state’s growing aptitude in building welfare institutions, and its deft management of major shocks – the Kan’ei famine of 1642, the Kyoho famine of 1732, and the Tenmei famine of 1782. In these instances, Japan built institutional memory of mobilizing self-governing entities, such as peasant villages, guilds, and fraternities, to provide timely hunger relief at points of crisis. By the Tenmei famine of 1783, Japan had developed an intricate system of relief administration, as Historian Maren Ehlers identifies in her study of the famine-struck town of Ono. In her narrative, Japanese authorities responded effectively through three conduits of hunger relief – “domain-sponsored seasonal rice gruel kitchen for beggars, a town-wide collection of rice donations for townspeople, and a domain-funded grain loan program.” Thus, Japan’s relief administration was quite effective, and this would have reinforced its self-characterization as “benevolent rule” to its people, a Confucian idea of political legitimacy based on the idea of the ruler’s ability to relieve people in crisis. Can we call Japan a success story? Maybe so. Its remarkable economic and population growth in the turbulent 1600s is unique. Also, Japan’s disaster relief, as described above, was efficient and punctual for most of the Tokugawa period. This success then is attributable to its ability to build mutually-supportive social institutions, which allowed for effective mobilization of resources and for flexibility to make ad hoc adjustments in the face of crisis. However, Japan’s management looks more successful if we focus exclusively on the 1600s, as Parker does, than if we consider the turn of the nineteenth century, when in fact, Japan bore the brunt of the Little Ice Age. Ultimately, this takes us back to the theme of heterogeneity, both spatial and temporal. Did Japan manage better in some areas than in others? When in Japanese history did the Little Ice Age strike harshest, and what does this say about the sustainability of Japan’s management in the long run? No clear answers exist in current scholarship. But so far there is good evidence from Japanese climatologists and their snow ratio comparisons that the last phase of the Little Ice Age occurred in 1781-1880 and was the coldest yet. Coincidentally, historians find the two most catastrophic famines of Tokugawa history in this period, and importantly, the eventual demise of the regime in 1868. A casual relationship between the two still awaits a fuller study. However, using Japan’s case, one may begin to think more broadly about climate-crisis management in terms of a regime’s adaptive capacity vis-à-vis external impact. The latter hits at different times and places, which may be managed through ad hoc marginal adjustments, or probably more effectively, through revamping the system. In determining which route to take, we should note the heterogeneity of impact, and contextualize it in the longue durée of history, which will likely expose veneers of inflated success, or frail confidence erected on unsustainable growth. 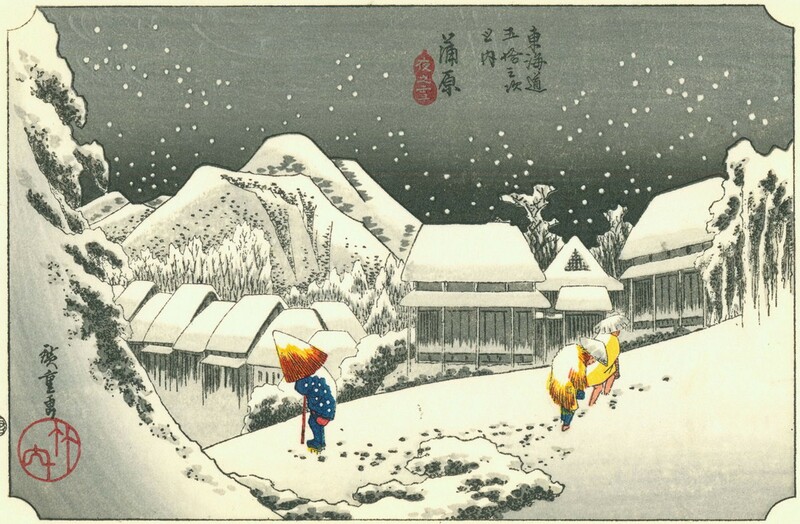 Image Credit: Evening Snow at Kanbara by Utagawa Hiroshige (歌川広重, 1797–1858) from Wikimedia Commons. Raised in China and Guatemala by Korean parents, Hyeok Hweon (Kevin) Kang is a PhD student in History and East Asian Languages at Harvard University. His research interests include environmental history, particularly the Little Ice Age and its impact on historical societies; Korean shamanism and exorcist rites; and the history of gunpowder weapons in early modern East Asia (1500–1800). His work on firearms has been published in professional academic journals such as the Journal of World History, and the Journal of Chinese Military History. As a graduate fellow at S&S, he hopes to share his recent interest in climate history, and re-think sustainability issues in light of historical societies that underwent ecological crises due to aberrant climate.